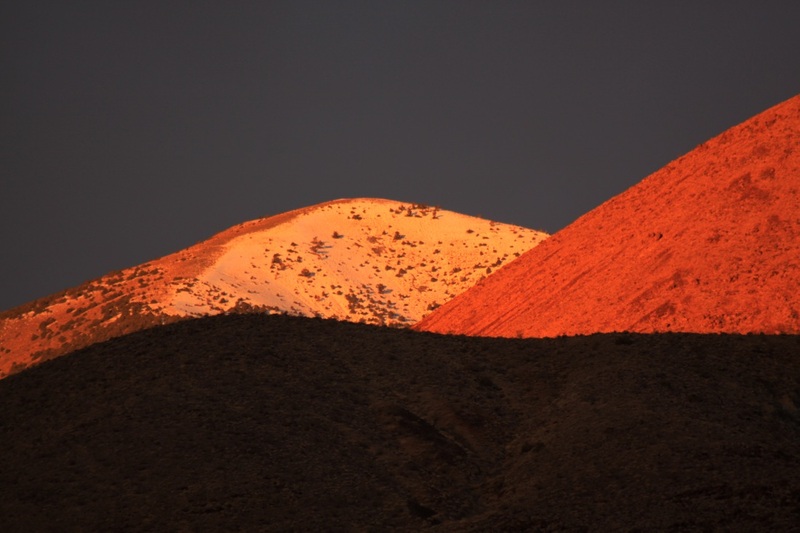 George and I planned to hike up to Telescope Peak above Death Valley in late May, figuring that winter’s ardor would have retreated but the summer heat would not yet be oppressive. We got only half of that right. Feathers before the stormFrom the summit of Telescope, the highest point in the Panamint Mountain range, one can look down upon Badwater—268 feet below sea level—the greatest altitude change over the shortest horizontal distance in North America. That appealed to George the science teacher, star tracer, former wilderness ranger, and indefatigable grinner. We camped our first night in a tiny copse of limber pines at 10,000' on the flanks of Telescope. We were delighted to pitch our bags within a few paces of a snow bank, affording a blissful luxury of water, although not exactly a swimming hole. From our vantage point, we could peer through crystal air deep into both long desert valleys on either side of the spine of the Panamint Range. 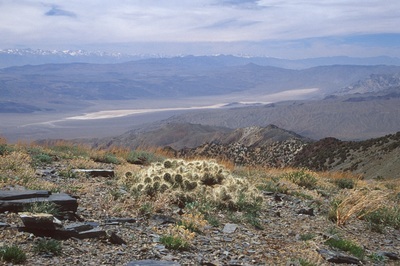 Looking West, the split crater and the remote Panamint dunes lay at the north end of 60 miles of scorched desert sand. 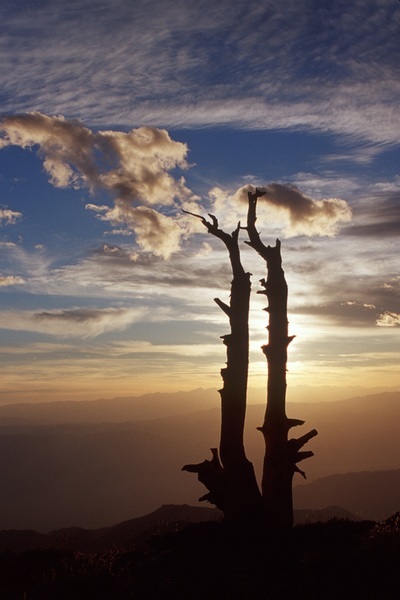 The Western horizon displayed the entire 200 mile long sawblade of the Eastern Sierras, including Mount Whitney. We looked East over Hanaupah Canyon's improbable green stripe , down across the vast playa of Death Valley shimmering in 110 degree heat , and across to Dante's View in the Funeral Mountains. To the North, the White Mountains harbored the next nearest colony of defiant bristlecone pines—150 miles away from the ones we would touch on our hike up Telescope. We enjoyed a spectacular sunset our first night, but what made it memorable was flourish of light among wind-sculpted lenticular clouds—harbingers of big weather coming. A curious opacity blurred the Western valleys and hid contours of the Sierras as the sun abruptly disappeared into a velvet pouch. It was time to boil the pasta and pour the Primitivo. The wild mushrooms, pine nuts, sweet onions, and Gruyere sent us happily to sleep. By the time we made coffee the following morning, the wind was already blowing hard. Mackerel cirrus and ice feathers splayed across the stratosphere of an azure sky. We soon learned a visceral lesson in air pressure. We could envision the hot wind of the desert tearing before the approaching front, compressing through the natural Venturi funnels of the canyons, accelerating up the abrupt wall of the Panamints, shedding 80 degrees as it screeched skyward, thrashing every living thing in its path until it raked over the ridgeline…where we were hiking. On the way back down from the summit, one fierce gust blew me up a steep embankment, my toes barely scraping the clattering shale...and I'm no longer a featherweight. 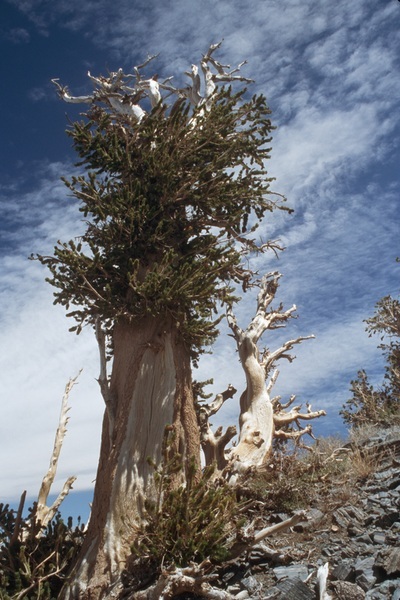 It certainly gives one respect for those bristlecone pines putting up with this abuse for 3000 years! The sunset was noisily austere, with bruise-black clouds stacking in the northwest and wind whistling through the junipers. However, the Cajun red beans and rice tasted good and the wine was, once again, perfect. By dawn the next day, the sky had turned the color of wet slate, and freezing rain was blowing horizontally through our flapping shelter. When that turned to snow, we realized that even Primitivo wasn't going to make another night up there palatable, so we came back. It felt like a privilege to be so close to something so vast, so powerful, and so blithely indifferent to whatever human concerns we carried with us. We carried a few back down, but now, we'll deal with them with a bit more confidence. Of course, that doesn’t preclude finishing the Primitivo. Come see us and put some aside for your next brush with Mother Nature.